Posh chairman Darragh MacAnthony is confident about his club's chances. Peterborough United chairman Darragh MacAnthony was in typically bullish form as he delivered his traditional pre-season address to his club’s fans. MacAnthony’s targets for the 2017-18 campaign include the League One title, 110 goals and the divisional Golden Boot! Posh chairman Darragh MacAnthony (left) has been pleased with director of football Barry Fry's work this summer. “*We can win League One. Posh chairman Darragh MacAnthony is a big fan of midfielder Anthony Grant. *We can have a few players in the League One team-of-the-year. *We can receive some international call-ups. Posh striker Jack Marriott is a greyhound with great technical ability according his his chairman. “It’s been a great summer for us and an excellent transfer window. “We needed to seriously change the type of personality we have in the dressing room which we have done. “We also needed to improve the quality of our squad which we have also done. 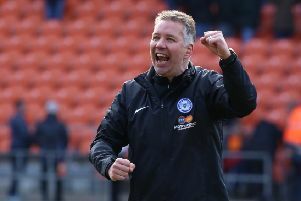 “It’s been the biggest upheavel since the first January/summer of Darren Ferguson’s reign as manager when we also brought in top players with great attutudes like the Holy Trinity of George Boyd, Craig Mackail-Smith and Aaron Mclean. “We are a club that has given so many great young players their big opportunity, but last season our very young manager had to deal with so many bad situations I’m actually surprised we finished as high as 11th. “We couldn’t speak publicly about some of the things that went on because the PFA wouldn’t let us, but trust me, our rookie manager dealt with everything impeccably. “The off-field problems definitely affected us on the field though and it will be different this season. “We have now signed great characters with bubbly personalities like Danny Lloyd and Ricky Miller. It was a priority to sign top players who had great attitudes. “We did solid due diligence on all of them and we made it clear in (the pre-season training camp) Spain what we expected from them. “I did a 90-minute presentation stressing that it’s not just about winning matches, it’s about buying into the ethics and ethos of Peterborough United. “I want the players out in the community. I want them all to do their bit, but I want them volunteering rather than waiting to be asked. I also want them to stick together when the going gets tough as it will at times during the season. “I want the players to all bust a gut to get into the first-team, but if they’re not picked I want them on the sidelines cheering us on. “Ricky Miller tweeted something the other day about getting behind the lads even though he is suspended for the first six games and that’s the sort of attitude I want. “In the past that hasn’t always happened. Players who weren’t getting picked became a problem and that is very unsettling. “I want winners this season not sulkers. “It’s great to have a happy camp, but that has to translate into a winning football team. “I am confident we will be a better team this season, but the proof will come by us winning matches. “I’m excited by the forward line we’ve put together. Last season, for the first time I can remember in my time at the club, we had very little pace up front. In fact we’ve lacked pace since Conor Washington left. “We had the worst set of strikers, goal-ratio wise for years. “Last season no League One defenders feared us. We were too easy to play against. We were too predictable. “We’ve addressed that now. We have serious pace up front and I believe Jack Marriott will be the one who really pleases our fans. He’s a greyhound with the technical ability to play in the Championship. “Danny Lloyd is our wildcard. Our manager already believes he will be challenging Marcus Maddison for his place in the side. “Michael Doughty will be an important addition in our midfield. He was a key target for us this summer. “If he, Chris Forrester and Anthony Grant combine as I think they will, it will solve many of our midfield issues from last season. “It’s a tragedy Anthony Grant has never played higher than League One, but I think the penny has dropped with him. He’s been brilliant this summer. “Defensively Ryan Tafazolli had a good first season with us, but he will be even better this time around and we will be managing Jack Baldwin carefully. Our win percentage when Jack plays is impressive. “We’ve had to be creative with our budget. I’d loved to have been able to sign Ollie Watkins from Exeter and if we’d have been in the Championship I’d have competed strongly with Brentford for him. “People have been banging on about Bury and the amount of players they have signed, but they knew they were going to get a million pounds for James Vaughan and they could plan accordingly. “We acted quickly when we sold Michael Bostwick. That move helped us bring Steven Taylor to the club on a good contract - we are good payers to good players - and to bring Alex Penny into the squad and what a good player he will turn out to be. “Everyone is aware of Taylor’s pedigree and he will be a big signing for us. He is as fit as an ox. “And there were Premier League teams in for Penny. They all spoke highly of him. “We have a good blend and I am confident everyone wull step up and perform this season. “Fans need to remember that we brought Michael Bostwick to the club to help keep us in the Championship and we kept him to help us get back there. The second part of Darragh MacAnthony’s interview will be online tomorrow (August 4).